As I’ve stated on here before, one of the things I love about doing MBIP is all the cool people I get to meet. The other day while waiting to meet Erik Reader for lunch, I met Bill Ordaz, who’s President of the Central Illinois Landmarks Foundation. 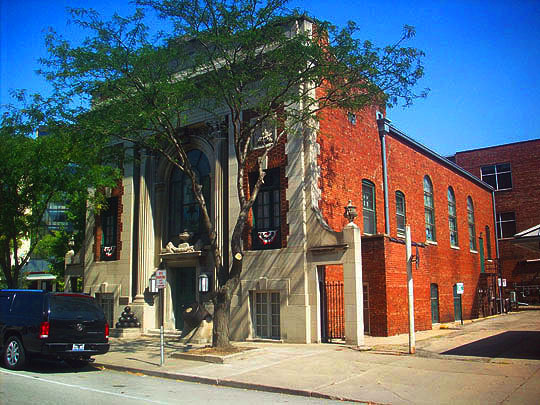 We had a nice chat and later via email, he offered to give me a tour of the Grand Army of the Republic Hall, which is an historic landmarked building downtown. I’ve driven by that building many times, but I’ve never been inside, so I took Bill up on his offer and so now let’s go take a tour of the GAR Hall in beautiful downtown Peoria! Here we are at the GAR Hall. Years ago the building was in bad shape and the CILF has transformed it into the historic site it is today. The Hall was built as a meeting place for Civil War veterans and their families to share their memories and experiences. 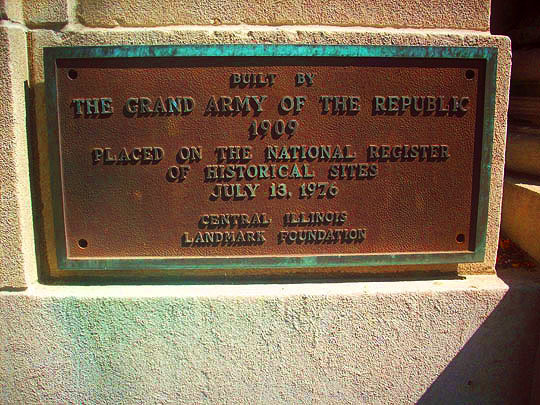 As you can read, it was placed on the national registor of historical sites on July 13, 1976. That was the year I graduated from high school. And here's our tour guide, Bill Ordaz! 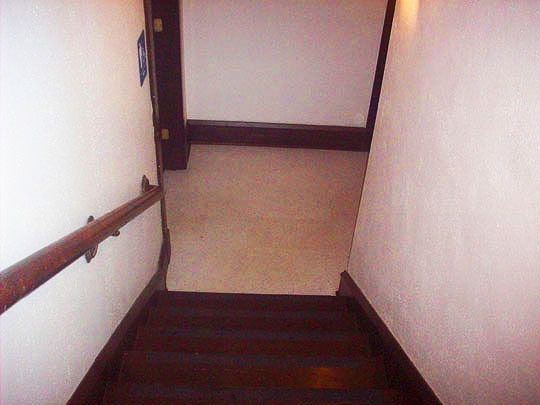 The first thing you see as you enter the building is this impressive set of wooden steps. Step lively and let's begin the tour. The view of the stained glass in the front of the building from the top of the stairs is quite impressive. Here's a bust of Major John Logan. Bill told me he was responsible for the Memorial Day holiday, so thank you for the day off, Major John! 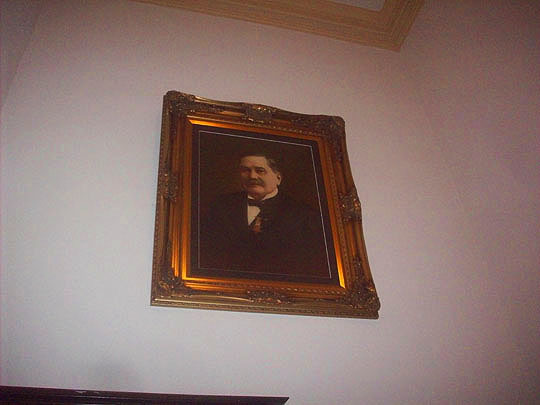 Some of the original funding for this building was provided by this man: Joseph B. Greenhut, who's picture hangs in the front hallway. 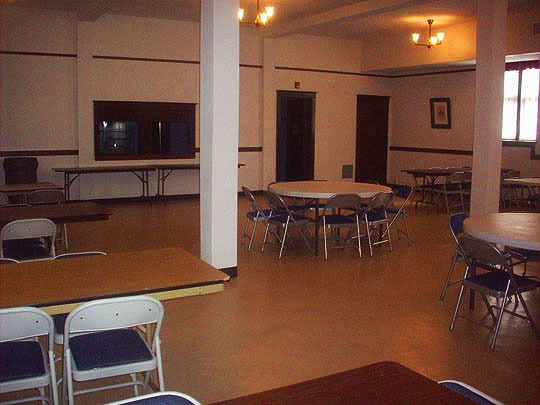 Information about the hall and how you can rent it for events such as wedding receptions and business meetings are available here at this table in the front hallway of the building. 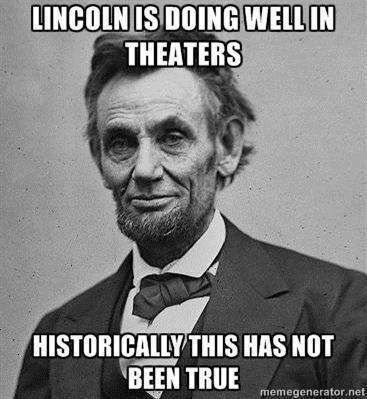 Obligatory Abraham Lincoln historical landmark photo! The first stop on the tour was the library which is located on the first floor. Here's the table where the board of the CILF gather round. You can't sit in this chair as it's a vintage antique from back in the day. 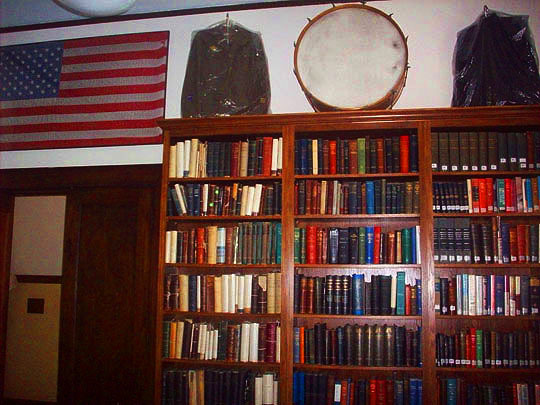 Books and artifacts from the Civil War line the walls in the library. Bill told me that this is what's known as a "War Log." It's a stump of a tree that has a cannon ball shot into it and was preserved with this plaque. This is the main room/ballroom at GAR Hall. It's a spacious room with a nice stage. Here's another shot from the side of the room. I love the wooden floor in here. Stained glass windows line the walls. Here's a shot of the room from the top of the stage. Bill told me that this room has been used from everything from wedding receptions to business meetings to Peoria Ballet functions. I love the woodwork on this vintage organ on the stage in the ballroom. Civil War photos line the walls in here, like this one from Andersonville Prison. There's also Civil War artifacts and antiques in cases to check out in here. I asked Bill if "Aunt Lizzie Aiken" was the namesake for the notorious Aiken Alley back in the day, but he wasn't sure, so we'll just assume she was. Here's a quartet of Civil War generals on the wall of the main ballroom. 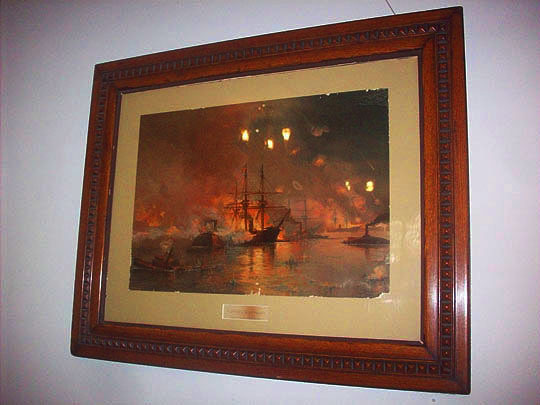 A framed document from the second generation of Civil War Veterans, The Sons Of Union Veterans Of The Civil War. As you can see it's another spacious room in the historic building. Bill told me that people have gotten married outside in the park, ate dinner in here and then had a party upstairs in the ballroom. There's more Civil War memorabilia lining the walls in this room too. 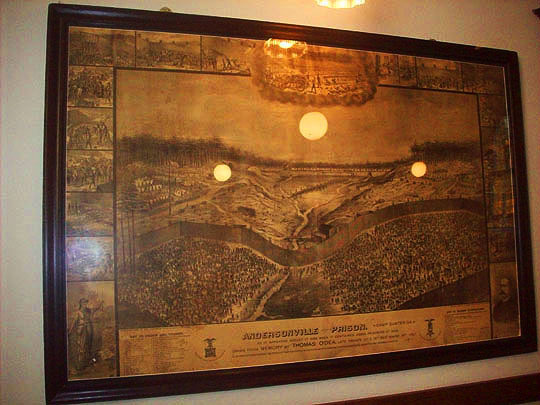 Even if you're not into the Civil War, you'll love all the vintage art hanging on the walls in here. 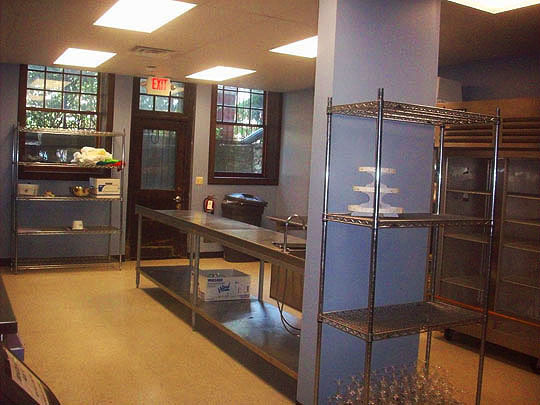 There's a full catering kitchen behind the dining room. 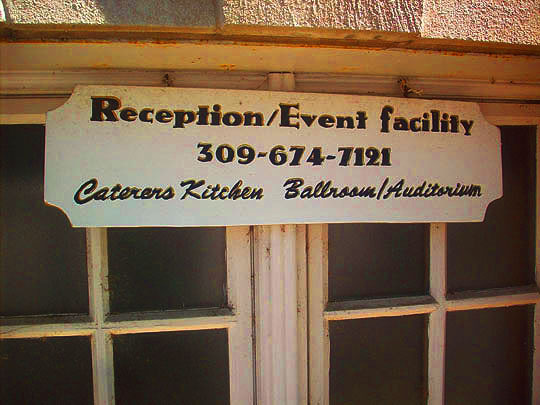 Here's the number to call if you'd like to book an event here at GAR Hall. 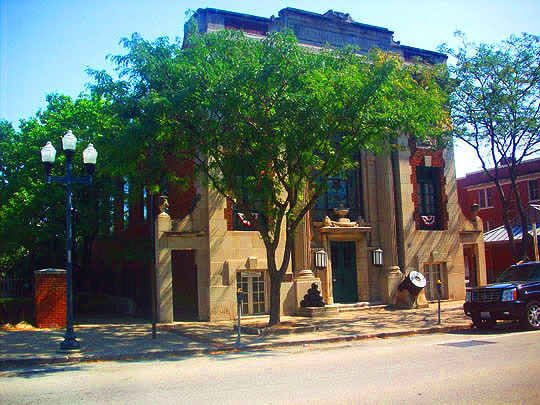 If you do, you'll not only have access to a cool part of historic Peoria, you'll help keep this building alive and on the block. We'll see you all tomorrow. Further reading: PJ Star, Central Illinois Landmarks Foundation and facecrack.